Plenty changed in our newest refresh of this article, with a few older models – such as the Seagull Maritime SWS – making way for some cool new additions. None quite as cool as the incredible Fender Newporter, although both the eco-friendly Martin DX1AE and ergonomic Washburn WCG55CE Comfort both earn their place too! Ah, the sweet smell of premium! While a guitar in this category may not be deemed high-end by everyone, dropping $1000 on an acoustic guitar is a serious purchase for the majority of us. What Can You Expect from an Acoustic in the $500 to $1000 Range? Thankfully, the guitars in our chart justify the money and usually offer more than a grand’s worth of feel, design and tone. You’ll find exotic woods, professional-grade performance and stage-worthy electronics, as well as a few extras you probably weren’t expecting. In this chart we have tried to include models from all respectable acoustic guitar brands to give you a true flavor of what is out there. If $1000 is stretching too far, you may want to check out our list of top-rated acoustic guitars for a quality guitar that will match your budget. But, for those of you still interested in buying something really special, let’s see what’s worthy of your time. Note that in our chart we only feature steel-string models. If you’re looking for a nylon-stringed guitar, we have a separate page dedicated to classical guitars under $1,000. An outstanding model by Seagull. Worth every penny. A beautifully innovative Breedlove worth every penny. An acoustic workhorse with beautiful tone. A big voice for its smaller size and great electronics. A distinctive acoustic with a true taste of Cali! An affordable Martin with deceiving looks, but a killer sound! A modern classic, all-solid-wood acoustic from Fender. Comfort and style aplenty with this flexible Washburn acoustic. Unmistakably Ovation in design, this is a true stage-worthy electro-acoustic. If you want an upgrade or a new primary instrument with outstanding quality and tone, here is your answer. The Artist Mosaic is an all solid wood acoustic with a cedar top and mahogany back and sides. The mahogany neck with rosewood fingerboard is a joy to play whether strumming chords or picking lead lines. The tone is warm with plenty of clarity. The modified dreadnaught sized body gives the guitar a big voice that is even without overwhelming bass response. The hardware is of good quality and keeps the guitar nicely in tune. Seagull has been consistently making very nice instruments, and the Artist series is the icing at the top of their cake. While you can’t see it from the photos, there’s a piece missing from the side of this beautiful guitar. But fear not – Breedlove isn’t saving on materials. Instead, the brand offers a second soundhole, which gives the player the opportunity to hear exactly what the audience are hearing. An innovative feature that matches the thought put into the rest of this Korean-made steel-string acoustic. As for materials, the top features solid red cedar, with laminated rosewood on the back and sides, leading to a warm but balanced tone. This electro-acoustic also features versatile L. R. Baggs electronics, with a built-in tuner, a pinless bridge, and a gig bag. The full review has much more on the excellent Breedlove Solo Concert. Another new guitar on this chart is the A3M electro-acoustic, which is part of Yamaha’s performance-focused A Series. This workhorse of a dreadnought sports a relatively elegant body in terms of design, although it feels incredibly high-end when playing. This is largely down to the mahogany neck, where the hand-rolled fretboard edges steal the show. The overall craftsmanship and materials also equal quality. As we elaborate on in the A3M’s full review, the body is made entirely of solid wood, with a Sitka spruce top and mahogany making up the rest of it. As for plugging in, Yamaha’s S.R.T. system takes advantage of both mic and piezo pickup input, and really performs well, with good versatility. The Taylor 114CE features Taylor’s Grand Auditorium body shape – making it a decisive, attention demanding tonal machine. Included in the guitar is Taylor’s Expression System 2 pickup. There is a volume and tone knob on the upper bout of the body. It features a cutaway in the solid spruce top for catching those notes on the higher frets. The back and sides are laminate sapele. There is even a case included in the price of the guitar. Each string cuts through with nice clarity. The sound is bigger than the size of the body would lead you to believe. Grabbing your authentic Taylor tone is more accessible, now more than ever – when considering both playability and affordability. One of the most distinctive acoustics on this list is the Newporter Classic from Fender’s popular California Series – a sleek and unique guitar that offers so much for the midrange price. The body is made entirely of solid wood, with a spruce top – sporting that beautiful Cosmic Turquoise paintjob – along with unpainted mahogany back and sides. The mahogany neck is fun to play, with Fender’s C shape and a smooth satin finish. It’s the detailing that wins us over – as highlighted in our in-depth look at the Newporter Classic – with a painted Strat-style headstock, koa binding and Viking bridge. The addition of Fishman custom-voiced electronics makes this guitar worth checking out for stage performers who like to be center of attention! The DX1RAE is your ticket to a genuine, full-sized Martin guitar at a price that leaves you with enough cash for a decent acoustic amp – and change from a grand! Martin keeps the cost of the electro-acoustic DX1RAE relatively low by making it from a selection of modern eco-friendly materials, which includes High-Pressure Laminate for the body, Stratabond for the neck, and Richlite for the fretboard (although you will find a good old solid spruce top). You can read more about these materials in the complete Martin DX1RAE review. Even with the unique build, it is a very rich and full sounding dreadnought with good warmth, reliable hardware and decent electronics. Well worth checking out! 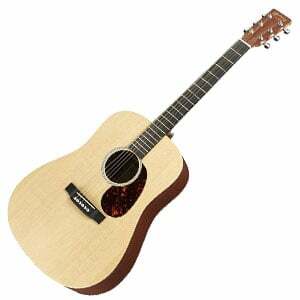 Part of Fender’s musician-targeted Paramount Series, the PM-3 is the ‘best of both worlds’ Triple 0 sized model, sitting between a dreadnought and parlor in terms of comfort and projection. A feature of the series is solid wood construction, with the PM-3 sporting solid Sitka spruce on the top, with solid mahogany on the back and sides, all finished in a high gloss. The mahogany neck is beautiful to play, with a comfortable C shape and 20-fret rosewood fretboard. As we highlight in the full review of the Fender PM-3, the collaborated Fishman/Fender electronics are impressive, and complement this acoustic’s natural, rich tone. Worth a closer look for singer-songwriters, that’s for sure. Comfort, tone and style – the WCG55CE from Washburn has it all! With a Grand Auditorium body shape, this electro-acoustic model features an all-koa body and a mahogany neck along with some fabulous mahogany and maple detailing. This features on both the intricate soundhole rosette and the comfortable armrest, which gives this guitar its name. However, it’s not just the bevel that makes this guitar a winner. It sounds great too, with a warm tone that copes nicely with everything from rock to country. Though the awesome Fishman Presys+ 501T system, stage performers will have no trouble shaping their sound. As always, our full analysis of the WCG55CE Comfort gives you all the details on this incredibly versatile Washburn guitar! Ovation’s Standard Elite 2778 AX is anything but standard, when compared to other acoustics on this list! However it’s a superb stage performer, with a quality pickup system and tone. 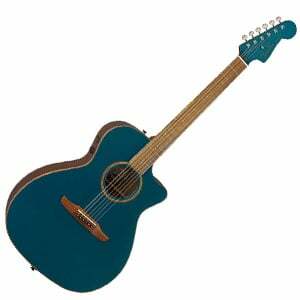 It features a deep contoured body shape with Ovation’s distinctive multi soundhole. The top is cut from AA solid spruce, while the back and sides are formed from Lyrachord composite. There’s a five-piece satin-finished mahogany neck with a rosewood fretboard and 17 frets along the whole neck, giving way to an extra five frets on the treble side (22 in total). The plugged-in sound comes from a pro-quality OP-Pro preamp and an OCP-1K pickup system – as highlighted in the full review of the Ovation Standard Elite 2778 AX. Firstly, it’s probably not correct to describe this category as ‘premium’, considering some acoustic guitars can reach prices of tens of thousands of dollars – they are true premium! However, this sub-$1,000 market is certainly as premium as many casual guitarists will go in their lifetime – which is great, because a grand in your pocket can pretty much guarantee you walk away with a quality guitar, with superb tone, beautiful style, and a little luxury you just can’t find on acoustic guitars under $500. Solid wood is a common feature in all the guitars on this list. Some will be all-solid-wood, while others will feature a solid top with laminated back and sides, which is great for both stability and travel (while keeping the cost lower). All the bodies and necks on these acoustics show off excellent craftsmanship. At this price they’re very unlikely to be made in American workshops, but they are still put together by experienced luthiers, with the fit, finish and setups feeling pretty high-end. Hardware is also upgraded when compared to lower-end price ranges, with quality electronics and versatile preamps (if it’s an electro-acoustic), well-functioning tuners and bridges, and bone nuts and saddles. Most guitars will also come shipped with a case, whether that’s a hard-shell case or a padded gig bag. Tonally, these guitars will sound high-end. Of course, the actual tone will depend on the materials, size and construction of the guitar, but most of these acoustics are wonderfully deep and resonant – a combination of quality materials and excellent craftsmanship. If the guitar is made with solid wood, even just the top, this will eventually develop with age, producing a richer, fuller tone with every passing year. Are these guitars really that good? Yes, they are! You can spend $500 to get a good guitar, or you can spend up to $1,000 and walk away with something that will last you a lifetime. You can go higher – check out our acoustic guitars under $1,500 and under $2,000 categories – but for many guitarists, you’ll find something worthwhile in the chart above. After reading some reviews and watching some videos, the best thing you can do – if possible – is to go and try some out. Take your time, and you will eventually find the acoustic guitar that is perfect for you! I’ve had my Epiphone Masterbilt DR-500MCE for about 3 years now, and still love it. I get all sorts of compliments, both on sound and looks. It is all handmade in Indonesia, but gets a final setup using Gibson’s Plek system. Very easy playing with a perfect fit and finish. Sounds like a much more expensive instrument. Love the Seagulls but does the Faith Blood Moon not even deserve a mention? Beautiful looking and sounding guitar that is reasonably priced but compares well with any of these. I recently purchased an Ibanez 300 for $499. 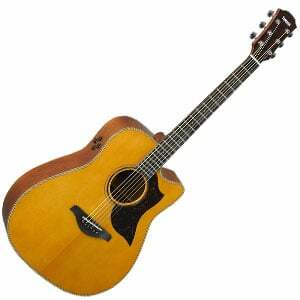 It is amazing and about a 10th the cost of a similar Taylor. Now the Builders Addition Taylor is definitely a better guitar, for my limited skills the Ibanez is perfect!